Over the last 10 years, fallout from the Great Recession has damaged the employment prospects of young adults just entering the workforce after graduating from high school or college. Finally, after 10 years of slow but steady recovery, young graduates’ economic prospects have begun to look up. Sustained improvements in economic conditions in recent years have brightened young graduates’ prospects for employment and wage growth. This report focuses exclusively on those graduating from college. Outcomes for recent high school graduates will be the subject of a forthcoming report, Class of 2018: High School Edition. In this study, we analyze data on recent young college graduates (ages 21–24) to learn about the Class of 2018’s economic prospects as they start their careers. We begin the report by providing a demographic snapshot of this population of young college graduates. In the second section, we discuss what shares of these young graduates are now enrolled in further schooling, employed, both, or neither. Third, we narrow our focus to only those graduates who are not enrolled in further schooling to find out how they are faring in the labor market—specifically, looking at their unemployment and underemployment rates. We also draw on literature that highlights the likelihood that many young college graduates will end up working at jobs that do not require a college degree. In the fourth and final section, we analyze the wages of those who are employed (and not enrolled in further schooling), making comparisons with earlier periods as well as looking at important differences by gender and race/ethnicity. While by many measures the labor market for young graduates is now almost—or perhaps even fully—back to where it was before the recession, the economy of 2007 represents a low bar for economic opportunity. We should instead be striving for the high-pressure economy of the late 1990s and 2000, in which an extended period of labor market strength translated into better opportunities for workers across the board. The economy needs to continue on track toward full employment for economic growth to reach all corners of the labor market. Because of the progression of the economic recovery and substantial declines in the unemployment rate, members of the college Class of 2018 currently have better job prospects than the classes of 2009–2017 did. However, compared with those who graduated into the 2000 labor market, the Class of 2018 still faces real economic challenges, as demonstrated by elevated levels of underemployment as well as worsened wage gaps, particularly for women and black workers. Fewer than one-fifth of adults ages 21–24 have a college degree. Women in this age group are more likely than men to have a college degree. Women make up about half of 21- to 24-year-olds, but well over half (57.3 percent) of young college degree holders are women. In this age group, whites and Asian American/Pacific Islanders (AAPIs) are more likely than blacks and Hispanics to hold a college degree. 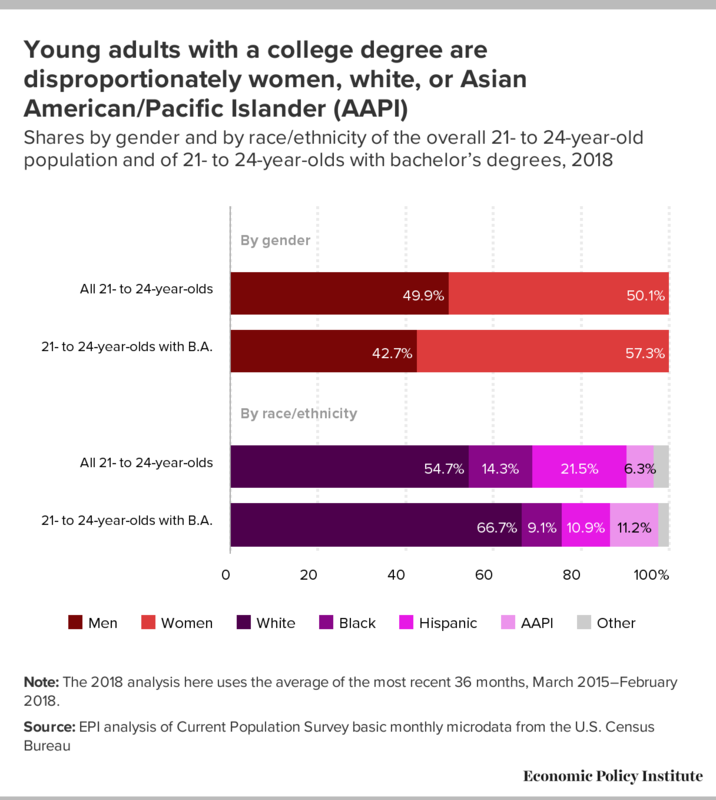 Whites represent just over half (54.7 percent) of the young adult population but two-thirds of those with a college degree; AAPIs are also disproportionately represented among those young adults with a college degree. Young black and Hispanic adults between the ages of 21 and 24 are far less likely to be college graduates relative to their representation in the population. The overall employment rate for young college graduates has declined and the share who are idled has increased between 1990 and 2018. Of those graduates who are enrolled in additional schooling, about half are working while enrolled and half are enrolled only. Employment and enrollment outcomes vary by gender and by race/ethnicity. The most likely outcome for every group is being employed only. The least likely outcome for every group, with the exception of Hispanics, is being idled, defined as being neither enrolled in further schooling nor employed. Young men and women graduates have similar idled and overall employment rates. 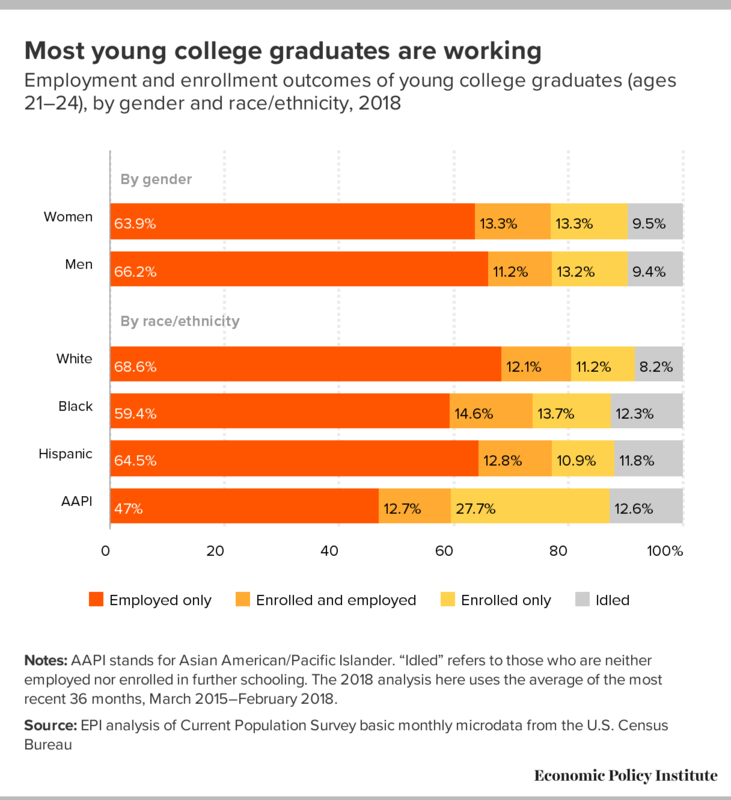 Young AAPI graduates are disproportionately more likely to be enrolled only, while young white graduates are the most likely group to be employed only and the least likely to be idled. Young black graduates are enrolled and employed at the same time at higher rates than their peers. The unemployment rate among young college graduates has fallen to pre-recession levels, but it is still higher than the full-employment economy of 2000. For young college graduates, the unemployment rate is 5.3 percent, compared with 5.4 percent in 2007 and 4.3 percent in 2000. While the unemployment rate for white graduates has essentially recovered to within 0.5 percentage points of its 2000 level, unemployment rates for other racial/ethnic groups remain higher than for whites and are significantly higher than their 2000 levels. The underemployment rate of young college graduates has recovered somewhat—at least relative to its business cycle peak of 18.8 percent (in 2011)—but it still remains higher than it was in 2007, and it is much higher than in 2000. Underemployment counts include those who are unemployed plus those part-time workers who would rather work full time (involuntary part-time workers) and those workers who want a job and have looked for work in the last year, but have given up actively seeking work in the last four weeks (and are therefore not officially counted as “unemployed”). For young college graduates, the underemployment rate is 11.1 percent in 2018, as compared with 9.4 percent in 2007 and 6.9 percent in 2000. The underemployment rate has not recovered as much as the unemployment rate, and therefore the underemployment–unemployment ratio—another way to measure remaining slack in the labor market—remains elevated relative to 2000. This, along with research on other forms of underutilization, suggests that young graduates are taking less desirable positions than they used to. Over much of the last four decades, young college graduates have experienced lackluster wage growth. From 1990 to 2018, average wages of young college graduates grew only 15.5 percent in total, growth that is attributable in large part to the tight labor market of the late 1990s and 2000. Without those few years of strong growth, wages today would be no higher today than they were in 1990. 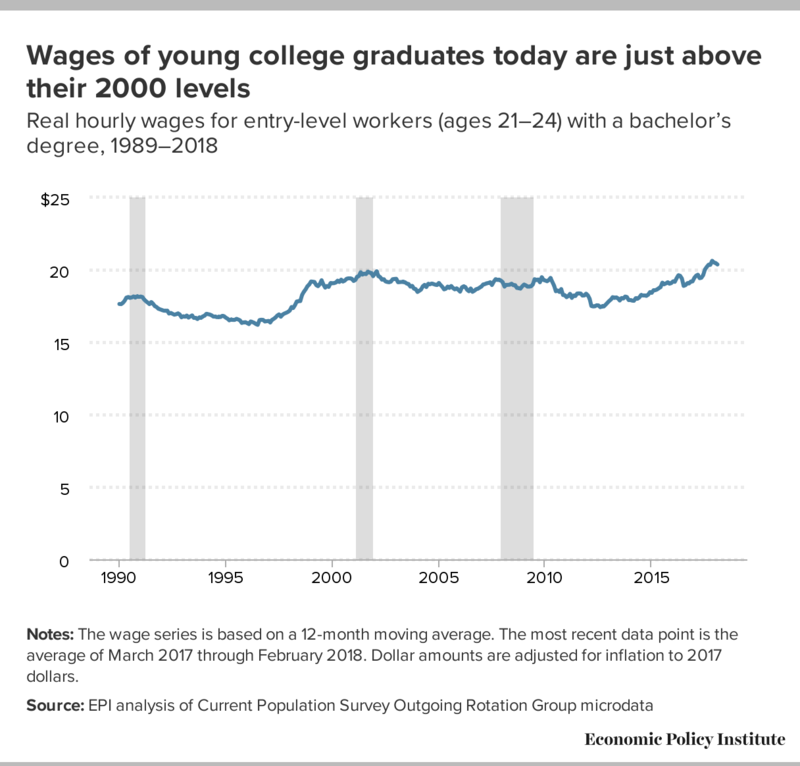 Wages for young college graduates have been growing steadily since 2012, and have recently surpassed the 2000 benchmark; however, this represents nearly two lost decades of wage growth for young college graduates. Young women and black college graduates face significant and growing pay penalties in the labor market relative to young men and white graduates, respectively. Because men’s wages have risen while women’s have barely budged between 2000 and 2018, the gender wage gap for young college graduates has grown over the last 18 years from 11.0 percent to 14.7 percent. In 2000, as well as for much of the late 1990s, the hourly pay of black college graduates closely tracked that of their white counterparts, but black wages have seen large declines in the Great Recession and its aftermath, translating into lower wages and significantly larger pay penalties right out of college. Today, young black college graduates face a 16.8 percent pay penalty relative to their white counterparts. Throughout this report, we examine the outcomes for young college graduates, who we define as adults between the ages of 21 and 24 with a bachelor’s degree but without an advanced degree. (We use “college degree” and “bachelor’s degree” interchangeably throughout to refer to a four-year degree.) When looking at labor market outcomes (unemployment/underemployment rates and average wages), we further restrict our sample to only those young college graduates who are not enrolled in further schooling. Most of the analysis in this report uses Current Population Survey (CPS) basic monthly microdata. For the wage analysis, we use CPS Outgoing Rotation Group (ORG) microdata; in the ORG survey, a quarter of the respondents to the CPS basic survey are asked additional questions about wages. Because we are examining such a small subset of the population, we use moving averages to increase the sample size and mitigate some of the volatility in the series. Unless otherwise specified, when looking at “overall” trends in the data, we use a 12-month moving average, which also has the added advantage of removing any seasonal effects. We use 36-month averages to look at trends by gender and race/ethnicity, since breaking the population down by demographics restricts the sample further and therefore any conclusions we can draw from it. In general, that means that analyses for 2018 use the most recent 36-month period, specifically March 2015 through February 2018. Our comparison of longer-run trends by gender and race/ethnicity uses two fixed points in time: the most recent 36-month period and the averages of January 1998 through December 2000, when the economy was close to or at full employment. Occasionally we use 2007 as a third comparison point in the text of this report, which, when using 36-month averages, refers to the averages of January 2005 through December 2007. The CPS asks respondents about both race and ethnicity, so respondents may be categorized as having Hispanic ethnicity and being of any race. To avoid including observations in multiple categories, we create five mutually exclusive categories for race/ethnicity: white (non-Hispanic), black (non-Hispanic), Hispanic (any race), Asian American/Pacific Islander (non-Hispanic; sometimes referred to as “AAPI” in this report), and “other.” As shown in Figure B, “other” makes up just 2.1 percent of young college graduates. Because of sample limitations, we do not report the results of our analysis for this “other” group. Likewise, gender is restricted to the two predominant binary categories: women and men. What are the demographics of young college graduates? In this report we examine the employment, enrollment, and wages of recent college graduates in order to glean the Class of 2018’s economic prospects as they start their careers after college. To do this, we look at recent college graduates (ages 21–24) who are in the labor market or enrolled in further education. Because the sample sizes for these groups are small, we have combined 12 months of data on a rolling basis to strengthen the estimates (see the text box above for extensive information about our sample and sample restrictions). Among adults ages 21 to 24, fewer than one-fifth (18.0 percent) have completed a bachelor’s degree but have not attained an advanced degree. An additional 1.5 percent have already completed an advanced degree. By comparison, more than two in five 21- to 24-year-olds (43.5 percent) have had some college education (but have not completed a four-year degree), while nearly three in 10 (29.5 percent) have a high school diploma only, with no further schooling. Note: AAPI stands for Asian American/Pacific Islander. The 2018 analysis here uses the average of the most recent 36 months, March 2015–February 2018. In this report we focus on graduates ages 21 to 24 in order to capture data about a particular group of people—those who enrolled in college soon after high school and graduated in about four or five years. By limiting our sample to college graduates in their early 20s, we can restrict any variation in outcomes attributable to both later degree-acquiring and higher amounts of labor market experience. This allows us to compare employment outcomes and wages across gender and race/ethnicity while assuming that the individuals have similar levels of education and work experience. The population of young adults with a college degree only is composed differently than the overall 21- to 24-year-old population. Figure B illustrates the disproportionate likelihood that members of certain groups have completed a four-year college degree. While men and women represent relatively equal shares of those ages 21 to 24, women in this age group are disproportionately more likely to hold a college degree. Well over half (57.3 percent) of young college degree holders are women, while men make up only 42.7 percent of those degree holders. While here we are looking at those with just a college degree, Figure A suggests that women in this age group are also disproportionately more likely than men to hold an advanced degree. 21- to 24-year-olds with B.A. Note: The 2018 analysis here uses the average of the most recent 36 months, March 2015–February 2018. Just over half (54.7 percent) of the 21- to 24-year-old population is white, yet two-thirds (66.7 percent) of young college grads are white. Asian Americans/Pacific Islanders also make up a disproportionate share of the young college graduate population (11.2 percent), relative to their representation in the overall 21- to 24-year-old population (6.3 percent). Young college graduates are less likely to be black or Hispanic, groups that account for 9.1 percent and 10.9 percent of that group, respectively. By comparison, 14.3 percent and 21.5 percent of all 21- to 24-year-olds are black and Hispanic, respectively. What are young college graduates doing? In this section, we look at the employment and enrollment outcomes of young adults with a college degree. We group these graduates into four mutually exclusive categories based on their outcomes: employed and not enrolled in further schooling (“employed only”), employed and also enrolled in further schooling (“enrolled and employed”), enrolled in further schooling and not employed (“enrolled only”), and neither employed nor enrolled in further schooling (“idled”). Figure C, which shows the share of all young college graduates with each outcome, uses 12-month moving averages to ensure an adequate sample. Figure D shows outcomes by gender and race/ethnicity; these outcomes are based on a three-year average to ensure an adequate sample to allow us to make these comparisons. Notes: “Idled” refers to those who are neither employed nor enrolled in further schooling. This series is based on a 12-month moving average. The most recent data point is the average of March 2017 through February 2018. Vertical shaded areas denote recessions. 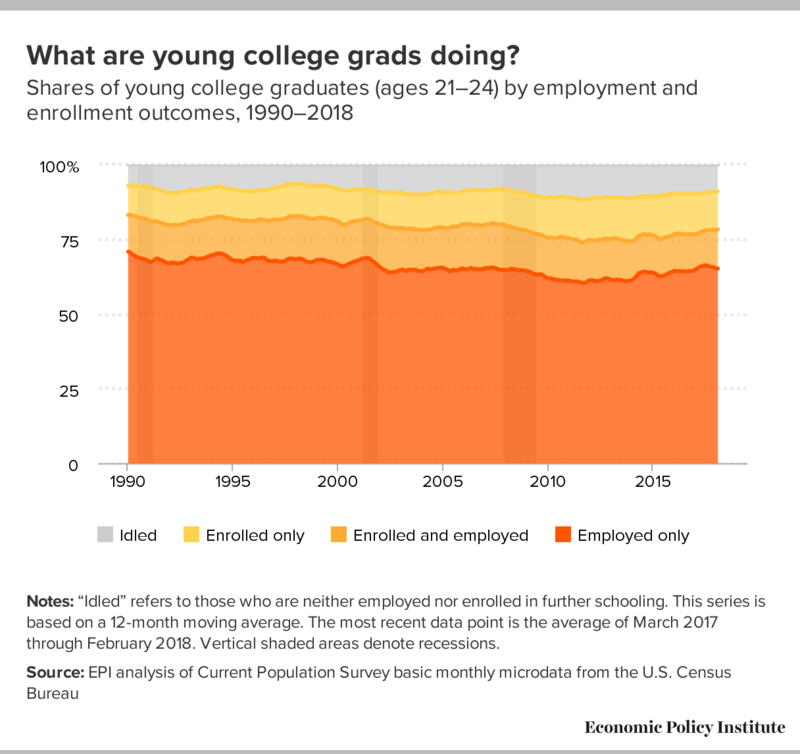 Figure C shows that idling—being neither employed nor enrolled—has consistently been the least likely outcome for young college graduates, although the idled share has increased since 1990. Prior to the most recent recession, just over 8 percent of young graduates were idled (8.2 percent in 2007), about the same share that were idled when the economy was at full employment in 2000 (8.5 percent). During the recession, the share of idled young graduates increased, peaking at 11.9 percent in 2011. This share has not quite recovered to its pre-recession level, with 9.0 percent of young graduates still idled in 2018. The increase in the share of disconnected young adults represents an enormous loss of opportunities for this cohort, as the loss of work experience or further education will have a lasting negative impact on their lifetime earnings. Nearly four in five young graduates (78.3 percent) are employed. (The overall employment rate is the sum of the “employed only” and “enrolled and employed” rates and is represented in Figure C by the darker and lighter orange areas combined.) The overall employment rate has declined over the period shown in Figure C (down 4.8 percentage points from 83.0 percent in 1990). This was driven by a steady decline in the share who are employed only, from 70.8 percent in 1990 down to 65.1 percent in 2018. During that 28-year period, the share who were simultaneously employed and enrolled increased slightly, although not enough to offset the decline in the share who were employed only. Particularly during the Great Recession, the growing idled share reflected not only a decline in employment rates, but a decline in enrollment as well (or the stemming of longer-term structural increases in enrollment). While enrolling in school is often thought of as an alternative to employment in a weak economy, this option is not available to all students: Students and workers are not distinct groups; many students must work to pay for school or cover living expenses. A weak economy can therefore prevent would-be students from pursuing additional education by disrupting their own financial stability. Many students also depend on the support of parents—but if a student’s parents saw the value of their home drop when the housing bubble burst, or one or both lost their jobs in the aftermath of the Great Recession, then financial support from parents for continued schooling may not have been available (see, for example, Lovenheim and Reynolds 2013). For these reasons, young graduates are at increased risk of being idled during a recession, with neither a job nor the resources to go back to school. Of those young graduates who decide to pursue further education (the sum of “enrolled only” and “enrolled and employed,” the light orange and yellow areas combined), an increasing share are not working while enrolled. The share of recent graduates who are enrolled only has generally increased since 2000. In 2000, one in 10 young graduates (10.3 percent) were enrolled in further schooling but not working while enrolled. By 2007, that share had increased to 11.9 percent. Today, about half of the young graduates who are enrolled in further schooling are also working (13.1 percent) and half are not (12.7 percent). Figure D illustrates, by gender and race/ethnicity, what these young college grads are doing now using four distinct categories: employed only (dark orange), employed and enrolled (light orange), enrolled only (yellow), and idled (gray). The first set of bars shows the differences in outcome shares by gender, and the next set shows differences by race. Notes: AAPI stands for Asian American/Pacific Islander. “Idled” refers to those who are neither employed nor enrolled in further schooling. The 2018 analysis here uses the average of the most recent 36 months, March 2015–February 2018. To see total employment, we look at the dark orange (“employed only”) and light orange (“enrolled and employed”) bars combined. We see that similar shares of young women and men with college degrees are employed. Although a somewhat smaller share of women are employed without being enrolled, that is balanced by the fact that young women are slightly more likely to be enrolled and employed at the same time than men. Young graduates of both genders are equally likely to be enrolled in further education without being employed, but young women with college degrees are more likely to be enrolled in further schooling overall (with 26.6 percent total enrollment) than their male peers (24.4 percent enrollment). (Total enrollment is calculated by adding “enrolled and employed” and “enrolled only” rates and can be seen graphically by looking at the light orange and yellow bars combined). Male and female graduates are equally likely to be idled (neither enrolled nor employed). As we will show later, young women with bachelor’s degrees have a lower unemployment rate than their male peers. But because these women are both employed and idled at similar rates to men, their lower unemployment rate reflects lower labor force participation, not higher levels of employment. In the second set of bars, similar comparisons are made with respect to the four mutually exclusive racial and ethnic groups we are looking at: white, black, Hispanic, and Asian American/Pacific Islander. Young Asian American/Pacific Islander graduates are much more likely to be enrolled in further schooling and much less likely to be employed than their peers. Although they are simultaneously employed and enrolled at a rate similar to their white and Hispanic peers, fewer than half (47.0 percent) are employed only. They are the largest group, by far, who are enrolled, driven by an outsize share of AAPIs who are enrolled in further schooling without being employed. In fact, they are the only racial/ethnic group with a larger share that are enrolled only than are both employed and enrolled. Young AAPI graduates are also the racial/ethnic group with the largest idled share. Young black graduates are simultaneously employed and enrolled at a higher rate than any other racial/ethnic group. After young AAPI graduates, young black graduates are enrolled without being employed at the second highest rate. In total, nearly three in 10 young black graduates (28.3 percent) are enrolled in further schooling. Overall, young black graduates are less likely than their white and Hispanic peers to be employed. Since young black graduates actually have the highest rates of being both employed and enrolled, their low employment rate is driven by their low likelihood of being employed only. One in eight young black graduates (12.3 percent) are idled, which is larger than the white and Hispanic shares. Being enrolled only is the least likely outcome for young Hispanic graduates, while for every other group the least likely outcome is being idled. About one in nine young Hispanic graduates (10.9 percent) are enrolled in further education without being employed, making them less likely than their black and AAPI peers to be enrolled only. Because they are enrolled and employed simultaneously at higher rates than young white graduates, young Hispanic graduates are slightly more likely to be enrolled in additional schooling than their white peers. Young Hispanic graduates are more likely to be employed only than their black and AAPI peers, but less likely than their white peers to be employed only. This trend holds true for the overall employment rate as well. A larger share of young Hispanic graduates are idled than young white graduates, although that share is even larger for their black and AAPI peers. More than four in five young white college graduates (80.6 percent) are employed, a larger share than any other group. This is driven by the fact that over two-thirds (68.6 percent) of young white college graduates are employed and not enrolled in further education. On the other hand, this group has the lowest share that are both employed and enrolled at the same time: Young white college graduates are less likely to be enrolled in further schooling without being employed than both black and AAPI young graduates. They are also less likely to be enrolled overall than their black and AAPI peers, with under a quarter (23.3 percent) total enrolled in further schooling. What are the employment prospects for recent graduates not enrolled in further schooling? In this section, we examine unemployment and underemployment rates for young college graduates. To do this, we narrow the sample of young college graduates to those who are not currently enrolled in further schooling. This allows us to better assess the employment prospects of otherwise similar groups. By attending and finishing college, young college graduates have made a significant down payment on their career in terms of both time and money, and they typically have very high labor force participation rates. And because a college degree affords more opportunities in the labor market—not least of which is the fact that college graduates are often more competitive relative to non–college graduates when it comes to landing even those jobs not necessarily requiring a college degree—unemployment among young workers with a college degree is substantially lower than among other young workers. However, young college graduates’ job prospects are significantly worse than they would be if the economy were at full employment. Figure E presents unemployment and underemployment rates for young college graduates, both of which shot up during the Great Recession and its aftermath. Note: This series is based on a 12-month moving average. The most recent data point is the average of March 2017 through February 2018. The unemployment rate reflects the share in the labor market who are jobless and have reported that they are actively seeking work. The unemployment rate for young college graduates is currently 5.3 percent, just below where it was before the start of the Great Recession in December 2007 (5.4 percent). However, it remains significantly higher than it was in 2000 (4.3 percent). And the current unemployment rate likely understates the slack in the labor market, given that, in recent months, 7 out of 10 newly employed workers were not actively searching for work in the prior month (Gould 2018b)—these workers would not have been counted in the official unemployment rate, even though they were clearly interested in working. Looking at the underemployment rate also broadens our understanding of the labor market for young college graduates (ages 21–24). The underemployment rate for college graduates in this age group, currently at 11.1 percent, remains nearly 2 percentage points higher than it was in December 2007 (9.4 percent). This rate includes the officially unemployed (see above), but also includes “involuntary” part-timers (those who work part time but want full-time work) and “marginally attached” workers (those who want a job and have looked for work in the last year but who have given up actively seeking work in the last four weeks and therefore are not captured in the official unemployment rate). In 2018, the ratio of the underemployment rate to the unemployment rate for this group is 2.1 to 1, which is much higher than it has been at comparable points in previous business cycles (1.7 to 1 in 2007 and 1.6 to 1 in 2000). This suggests that many young college graduates are still having difficulty finding full-time jobs or are working in positions in which they are underutilized. 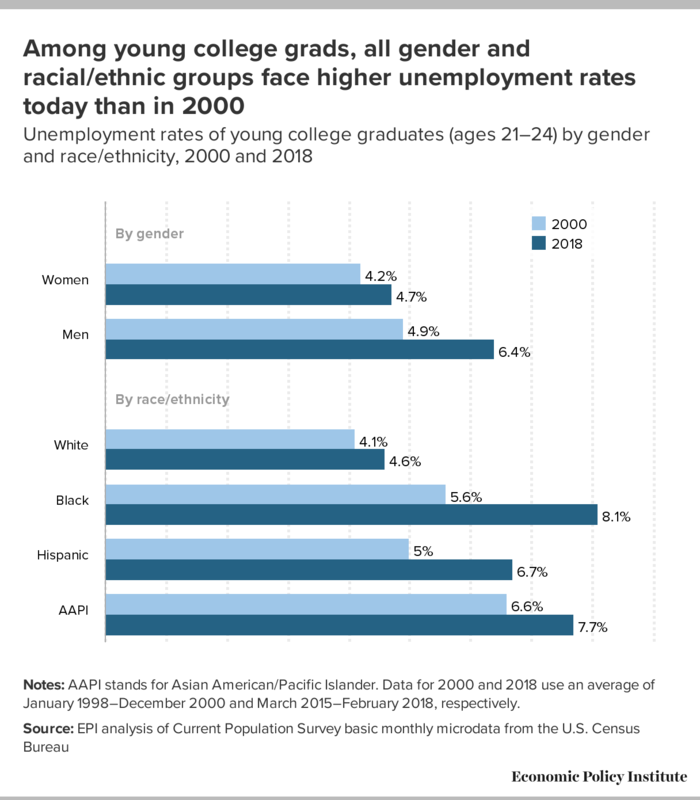 Figure F compares the unemployment rate by gender and race/ethnicity in 2018 to 2000, the last time wage growth was strong for all workers in the U.S. economy. While the overall unemployment rate (shown in Figure D) has dropped to its pre-recession level and is creeping down toward its 2000 level, some groups are faring better than others. Notes: AAPI stands for Asian American/Pacific Islander. Data for 2000 and 2018 use an average of January 1998–December 2000 and March 2015–February 2018, respectively. The white unemployment rate in 2018 was slightly above its 2000 low, up from 4.1 percent to 4.6 percent. The unemployment rates for all other races are even higher and have recovered less since the Great Recession, further widening the racial gaps. One would think there would be little disparity in the unemployment rates of young college graduates, who have the same basic degree and are in the same labor market position (i.e., college graduates, ages 21–24, not enrolled in school, and either employed or actively seeking work). It is notable that having an equivalent amount of higher education and a virtual blank slate of prior professional work experience still does not result in parity in unemployment rates across races and ethnicities: The unemployment rates of young black, Hispanic, and Asian American/Pacific Islander college graduates are much more elevated than those of their white peers. This suggests other factors may be at play, such as discrimination or unequal access to the informal professional networks that often lead to job opportunities. 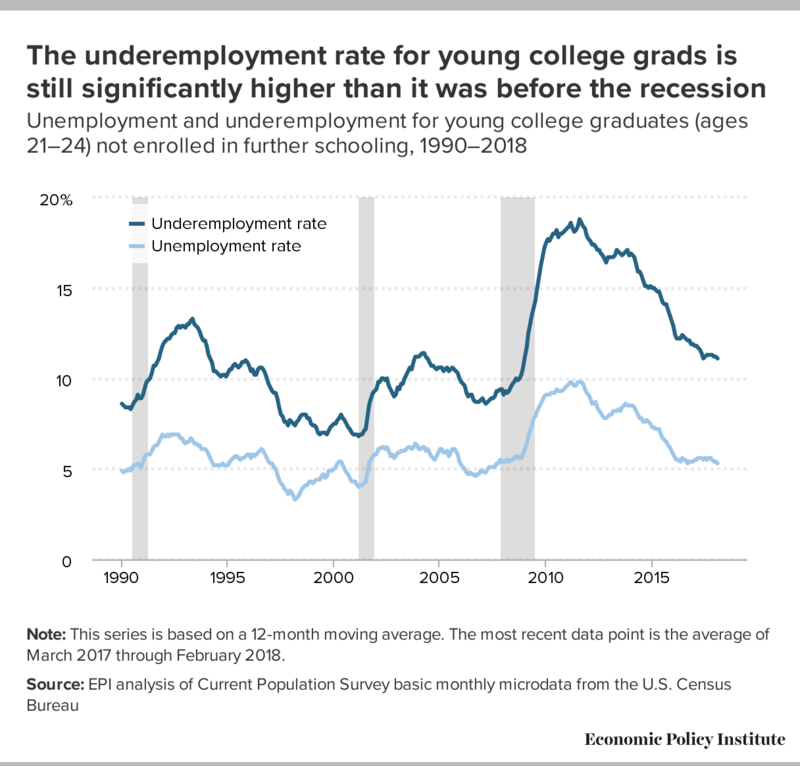 Figure G shows underemployment rates for young college graduates, which, like their unemployment rates, remain elevated above their 2000 levels, but to a greater degree. The increases in underemployment rates have been substantially larger than the increases in unemployment. Although there are still key differences in the underemployment rates of different demographic groups, the gaps are smaller than they are for unemployment. In 2000, young women and men with college degrees had fairly similar underemployment rates (7.1 percent and 7.6 percent, respectively), with the men’s rate being slightly higher. Over the next 18 years, underemployment increased significantly for both groups, but slightly more for men (by 4.9 percentage points, to 12.5 percent) than for women (4.1 percentage points, to 11.2 percent), widening the gap. But while the underemployment gap between young male graduates and young female graduates is growing, this gap is still smaller than the gap between the male and female unemployment rates. Since unemployment counts are part of the underemployment rate, the higher unemployment rate for men means that a smaller portion of total underemployment for men is attributable to involuntary part-time work or marginal attachment to the labor force. And, in turn, this means that a larger share of underemployed women than underemployed men are in part-time jobs or are marginally attached to the labor force (vs. being officially unemployed). In 2000, the underemployment rate of young black graduates was 8.7 percent, higher than the rate for young white graduates (7.0 percent). By 2018, the black underemployment rate had nearly doubled, increasing to 16.2 percent, while the white rate rose to only 10.4 percent. 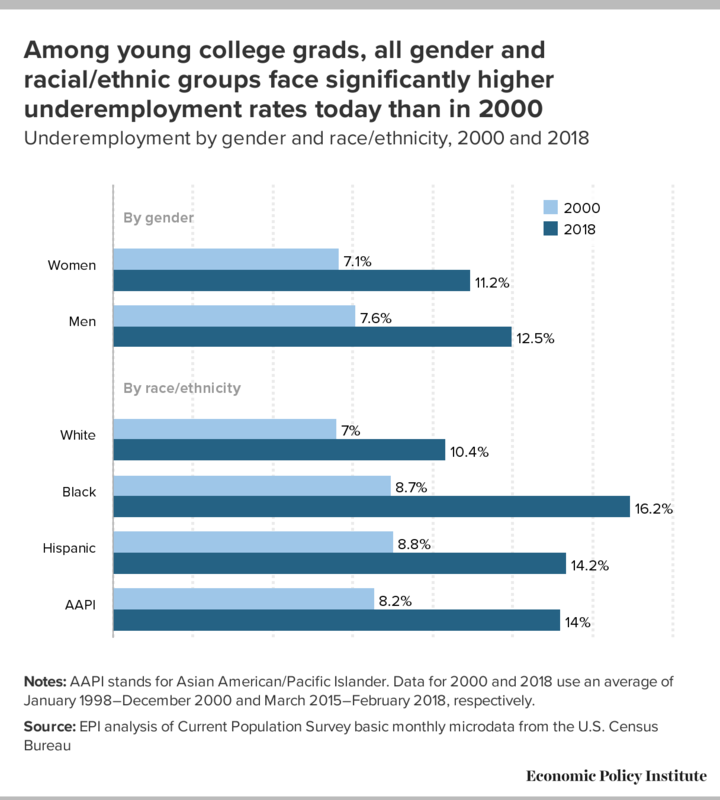 The underemployment rates of young Hispanic and Asian American/Pacific Islander graduates were also higher than the white underemployment rate in 2000 and grew more than white underemployment by 2018, increasing the already-existing disparities. Although the measure of underemployment used in Figures E and G2 includes hours-based underemployment (i.e., part-time workers who want full-time work), it does not include “skills/education–based” underemployment (e.g., the young college graduate working as a barista). Research from the Federal Reserve Bank of New York (Abel and Deitz 2014) offers insight into skills/education–based underemployment of recent college graduates. The authors categorize occupations according to whether the U.S. Department of Labor’s Occupational Information Network (O*NET) characterizes these occupations as requiring a four-year college degree, and then calculates what share of recent college graduates with jobs are working in jobs that actually require a college degree. First, it is important to note that even in good economic times, a surprisingly high share of young college graduates work in jobs that do not necessarily require a college degree. For example, in 2000—when jobs were plentiful and the unemployment rate was 4.0 percent—38.3 percent of employed college graduates ages 22–27 worked in jobs that did not require a college degree (Federal Reserve Bank of New York 2018). No matter how strong the labor market is, recent college graduates often require some time to transition into their desired career track. However, the share of young college graduates working in jobs not requiring a college degree increased over the weak 2000–2007 business cycle, increased further during the Great Recession and its aftermath, and has been slow to fall since. In 2007, 41.8 percent of employed college graduates under age 27 were working in a job that did not require a college degree. This share increased to 46.3 percent in the aftermath of the Great Recession and has been falling steadily since, reaching 42.5 percent by March 2018 (Federal Reserve Bank of New York 2018). Furthermore, more of these workers are ending up in lower-quality “non-college” jobs now than previously. In 2000, about half of recent college graduates who were in a job that did not require a college degree were nevertheless in a “good” job that tended to be career-oriented and fairly well compensated—such as electrician, dental hygienist, or mechanic (Federal Reserve Bank of New York 2018). That share has dropped substantially, to about one-third, while at the same time there has been an increase in the share of recent college grads who are now employed in occupations with low average wages, such as bartender, food server, or cashier. The bottom line is that for recent college graduates, finding a good job has become much more difficult. These findings are consistent with other research showing that, since 2000, among the workforce as a whole, there has been a decline in the demand for “cognitive skills” (Beaudry, Green, and Sand 2013). Taken together, these findings underscore that in recent years the elevated unemployment rate among young workers did not arise because these workers lack sufficient education or skills. Rather, there remains somewhat weak demand for goods and services, which makes it unnecessary for employers to significantly ramp up hiring for workers, regardless of their level of education. What are the wages of young college graduates? Over much of the last four decades, young college graduates have experienced lackluster wage growth. Figure H presents average hourly wages for young college graduates (ages 21–24, not enrolled in further schooling) between 1990 and 2018 (in 2017 dollars). Over that entire period, average wages grew only 15.5 percent in total. If it hadn’t been for the expansionary economy of the late 1990s and 2000, wages would be no higher today than in 1990. Wages at the last business cycle peak in 2007 were just below where they were in 2000. And then the Great Recession hit, and young college graduates experienced the loss in wages felt throughout the economy. Wages for young college graduates have been growing steadily since 2012 and have recently surpassed the 2000 benchmark. In today’s tightening labor market, we should expect to see continued wage growth, which will help make up for losses experienced by young college graduates in the aftermath of the Great Recession. But a high-pressure labor market will have to be sustained for quite some time to offset the longer-run wage stagnation facing this group. Notes: The wage series is based on a 12-month moving average. The most recent data point is the average of March 2017 through February 2018. Dollar amounts are adjusted for inflation to 2017 dollars. Although it may be tempting to point to young graduates’ age or lack of previous work experience as the reason their wages have failed to grow since 2000, we observe similar wage trends for the population as a whole (Gould 2018a). While young graduates have lower wages than the overall (ages 18–64) workforce of college graduates (which is to be expected given their relative lack of work experience), their wages display the same trends. Similar to what young graduates are experiencing today, college graduates in the labor force at large saw a brief period of strong wage growth in the 1990s, but have had stagnant or declining wages since 2000 (Gould 2018a). This is indicative of an economywide slowdown in wage growth, driven both by a lack of demand for workers and by the erosion of workers’ power to bargain with their employers for higher wages (Bivens et al. 2014). In 2018, young college-degreed workers have an average hourly wage of $20.37, which translates to annual earnings of around $42,300 for a full-time, full-year worker. This overall average masks important differences in wages by gender and race. Figure I looks at average wages for young college-degreed men and women as well as for young white, black, Hispanic, and Asian American/Pacific Islander (AAPI) college graduates, in 2000 and 2018, using a three-year average for more reliable comparisons among groups and across time. 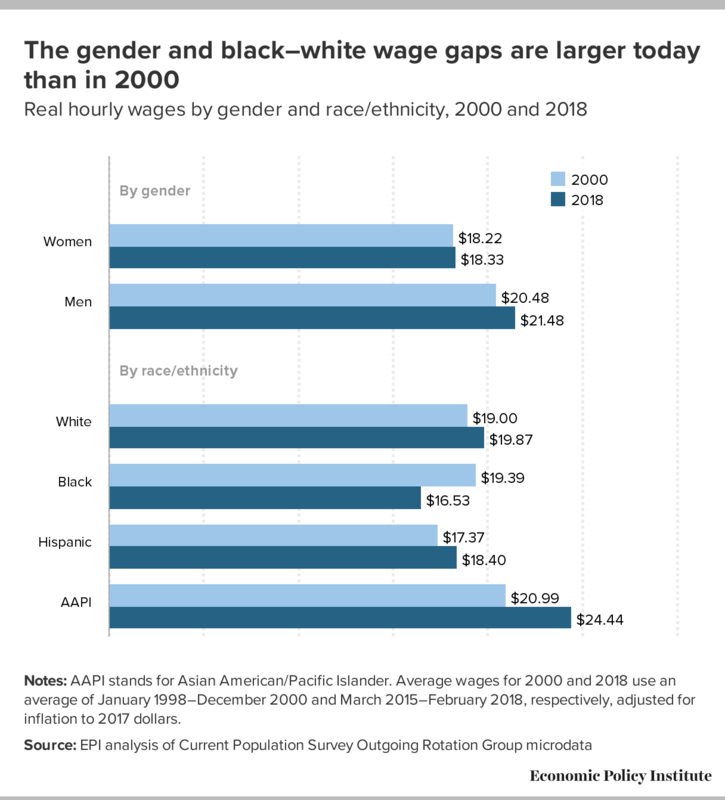 Figure J compares wage gaps between women and men as well as between white workers and black, Hispanic, and AAPI workers, in turn. Notes: AAPI stands for Asian American/Pacific Islander. Average wages for 2000 and 2018 use an average of January 1998–December 2000 and March 2015–February 2018, respectively, adjusted for inflation to 2017 dollars. * The black–white wage gap in 2000 is not statistically different from zero. Notes: AAPI stands for Asian American/Pacific Islander. Wage gaps are calculated from average wages for 2000 and 2018 using an average of January 1998–December 2000 and March 2015–February 2018, respectively, adjusted for inflation to 2017 dollars. Young women with a college degree have average hourly wages of $18.33 in 2018, just barely above their 2000 wage of $18.22. Over this same time, men’s wages rose from $20.48 to $21.48, an increase of just under 5 percent. These different trends have meant that the gender wage gap for young college graduates has grown over the last 18 years from 11.0 percent to 14.7 percent (as shown in Figure J). The current gap of $3.15 per hour translates into about $6,550 per year for a full-time worker, a large and economically meaningful difference. While, as discussed earlier, young women are earning bachelor’s degrees at higher rates than men (20.6 percent vs. 15.4 percent), this advantage is doing little to insulate them from wage gaps within educational categories. And different amounts of experience cannot account for these wage gaps: Given the tight age restriction in our estimates, both groups should have relatively similar work experience on average. The disquieting fact is that these gaps exist from the very beginning of women’s careers. 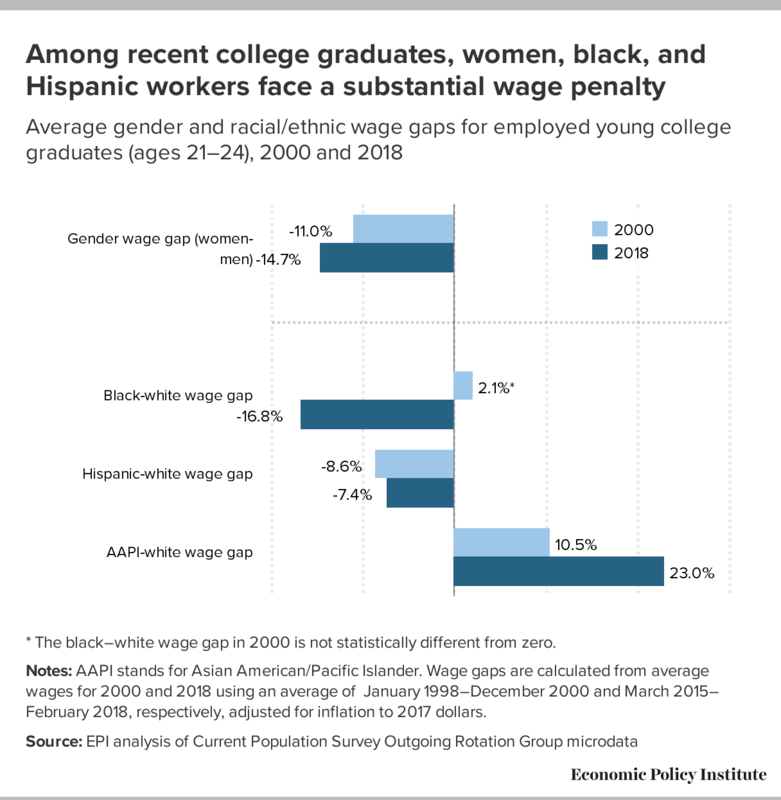 The second set of bars in Figure I show average wages for young white, black, Hispanic, and AAPI college graduates in 2000 and 2018. Asian Americans/Pacific Islanders had the highest wages and the strongest wage growth between 2000 and 2018 (16.4 percent). White and Hispanic college graduates also experienced wage growth, though at a much slower pace, at 4.6 percent and 5.9 percent, respectively. Young black college graduates experienced a large drop in pay—$2.86 per hour—for a total decline of 14.7 percent. The second set of bars in Figure J compare black, Hispanic, and AAPI wages with white wages in both 2000 and 2018. Asian Americans/Pacific Islanders have seen an increase to their pay premium vis-à-vis white college graduates, while Hispanic college graduates have seen a small reduction in their pay penalty with respect to white college graduates. The most striking finding from this analysis of wages is what has happened to young black college graduates. In 2000, as well as for most of the late 1990s, the hourly pay of black college graduates closely tracked that of their white counterparts. The 2.1 percent pay premium shown in Figure J is not statistically distinguishable from zero, meaning that white and black wages were basically the same in that period. What is stunning is the sharp decline in black wages over the last several years, during the Great Recession and its aftermath. They are the only group that saw outright declines, and these declines are quite large and economically meaningful. These trends in black–white pay differentials for young college graduates mirror what we are seeing in the larger economy. Wilson and Rodgers (2016) find that the growth in the divergence between black and white wages is largely unexplained by observable factors and that discrimination is likely the most significant of the unobservable factors at play. It is clear from the trends in the late 1990s and into 2000 that tight labor markets can reduce discrimination and may have some lasting power even as the economy cools, as it did in the early 2000s. But the Great Recession and its aftermath clawed back those gains and then some. The average hourly wage of black college graduates bottomed out in 2014 at $15.27 per hour and has only recently edged up to $16.53 in 2018 (trends not shown).3 As of the latest year of data, young black college graduates now face a 16.8 percent pay penalty relative to their white counterparts. This $3.34 hourly pay gap translates to just under $7,000 on an annual basis for a full-time worker. 1. EPI analysis of Current Population Survey basic monthly microdata from the U.S. Census Bureau. 2. The U-6 measure of labor underutilization from the Bureau of Labor Statistics. 3. EPI analysis of Current Population Survey Outgoing Rotation Group microdata. Abel, Jaison R., and Richard Deitz. 2014. “Are the Job Prospects of Recent College Graduates Improving?” Liberty Street Economics (blog of the Federal Reserve Bank of New York), September 4, 2014. Beaudry, Paul, David A. Green, and Benjamin M. Sand. 2013. “The Great Reversal in the Demand for Skill and Cognitive Tasks.” National Bureau of Economic Research Working Paper no. 18901, March 2013. Bivens, Josh, Elise Gould, Lawrence Mishel, and Heidi Shierholz. 2014. Raising America’s Pay: Why It’s Our Central Economic Policy Challenge. Economic Policy Institute Briefing Paper no. 378, June 2014. Federal Reserve Bank of New York. 2018. The Labor Market for Recent College Graduates (interactive). New York Fed website. Last updated April 27, 2018. Gould, Elise. 2018a. State of American Wages 2017. Economic Policy Institute, March 2018. Gould, Elise. 2018b. “What to Watch on Jobs Day: Multiple Measures Indicate the Presence of Labor Market Slack.” Working Economics (Economic Policy Institute blog), April 4, 2018. Lovenheim, Michael, and C. Lockwood Reynolds. 2013. “The Effect of Housing Wealth on College Choice: Evidence from the Housing Boom.” Journal of Human Resources 14, no. 1: 1–35. U.S. Census Bureau. 1989–2018. Current Population Survey basic monthly microdata. Survey conducted by the Bureau of the Census for the Bureau of Labor Statistics [machine-readable microdata file]. Accessed April 16, 2018, at https://thedataweb.rm.census.gov/ftp/cps_ftp.html. U.S. Census Bureau. 1989–2018. Current Population Survey Outgoing Rotation Group microdata. Survey conducted by the Bureau of the Census for the Bureau of Labor Statistics [machine-readable microdata file]. Accessed April 16, 2018, at https://thedataweb.rm.census.gov/ftp/cps_ftp.html. Wilson, Valerie, and William M. Rodgers III. 2016. Black–White Wage Gaps Expand with Rising Wage Inequality. Economic Policy Institute, September 2016.